This dollhouse miniature reproduction carton & pack of Salem cigarettes with ashtray with cigarette in it are 1:12 scale fake accessories for your dollhouse or miniature project. 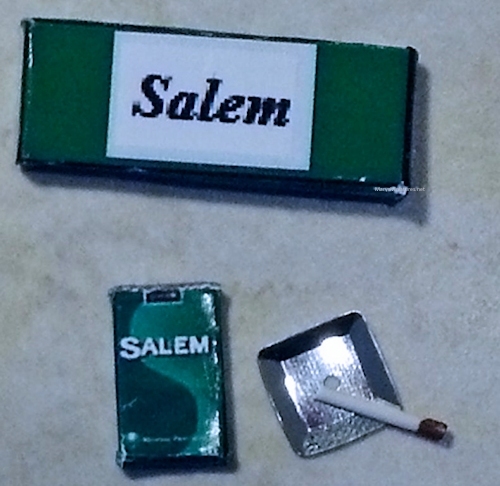 The miniature Salem cigarette carton measures 5/16" tall by 1" wide by 1/8" deep, the pack of Salem smokes measures 5/16" tall by 1/4" wide by 1/8" deep, the ashtray with cigarette measures 5/16" wide and both cardboard printed boxes have authentic labeling. 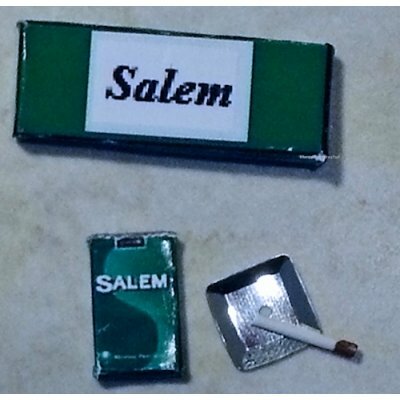 This Carton & Pack of Salem Cigarettes w/ Ashtray is supplied by Dolly's Miniatures, which generally ships within 1 business day(s) of you placing your order .